The learning and development company brings home a Gold award in the Training Mobile Sites & Apps category and two Silver awards in the Training Video category. 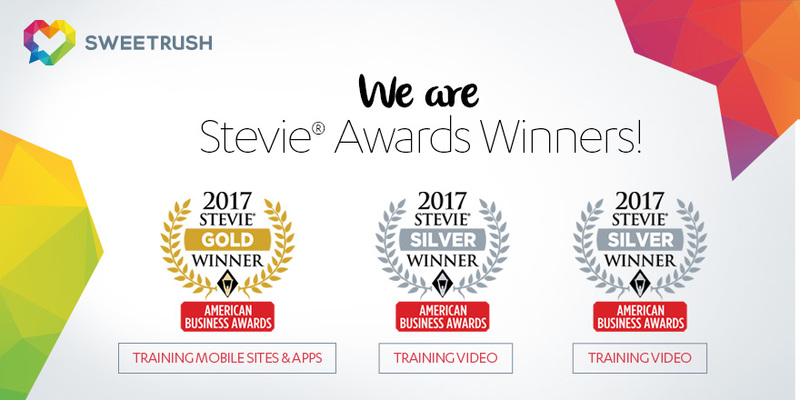 San Francisco, California, May 9, 2017—The 15th Annual American Business Awards has announced its results for 2017, and SweetRush, in collaboration with its clients, has been awarded three coveted Stevie® Awards—one Gold and two Silvers. In the Training Mobile Sites & Apps category, Counter Intelligence, a sophisticated mobile game designed to teach sales skills to an extended enterprise audience of sales associates for Bridgestone Americas, won GOLD. In the Training Video category, Natural Inspirations, a fully custom 3-D animated video for Bridgestone Americas about tire technology for sales associates, won SILVER. Also in the Training Video category, a SILVER award was given to the Hilton HHonors promotional/motivational video, a fully custom animated video about the loyalty program and its learning curriculum for Hilton Team Members. More than 3,600 nominations from organizations of all sizes and in virtually every industry were submitted this year for consideration in a wide range of categories. Find here more details about The American Business Awards and the list of 2017 Stevie winners. Stevie Awards are conferred in seven programs: the Asia-Pacific Stevie® Awards, the German Stevie® Awards, The American Business Awards, The International Business Awards, The Stevie® Awards for Women in Business, The Stevie® Awards for Great Employers, and The Stevie® Awards for Sales & Customer Service. Stevie Awards competitions receive more than 10,000 entries each year from organizations in more than 60 nations. Honoring organizations of all types and sizes and the people behind them, the Stevies recognize outstanding performances in the workplace worldwide. Learn more about the Stevie Awards at their website.